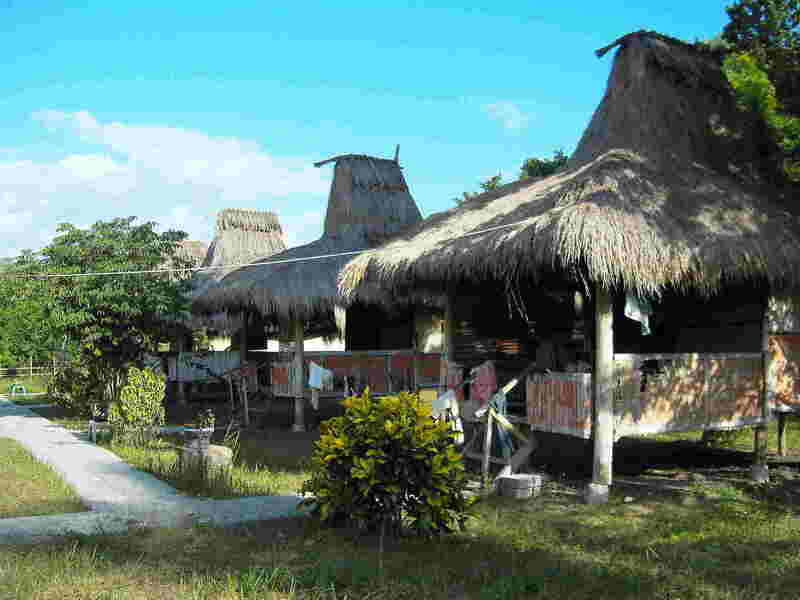 Accommodation in Sumba is few and far between and limited to towns. In the countryside, you can stay only in private houses or in a simple Homestay. Lately, more and more hotels in the upper price range are being built. If there is an official meeting in a town and important administrative officials from other regions arrive, hotels are often fully booked. But nowhere in Sumba is it a problem to find a place to stay in a private home. In Sumba, the price level of hotels is higher than in Bali. Maybe it's because of the lack of competition or the fact that many goods have to be imported from other islands. It is annoying, that you often have to pay for persons instead of paying for rooms, this makes traveling quite expensive. I put some additional information and pictures of Accommodations in Tripadvisor and Holiday Check under the name Sumbainformation. Pantai Cemara at Pantai Kambera is the only resort in this area. It is a, small, quiet, stylish but unfortunately extremely high-priced, direct on the beach. Bungalows are a bit too close to each other. Snorkelling, Riding and boat trips are possible – but unreasonably expensive. The surrounding area is totally bleak. Phone: 08123842178 and Website. Padadita Beach Hotel has just opened. It is located directly on the mangrove coast. It is a typical hotel type, as it is everywhere in the world - and now also in Sumba. The Surroundings are dull. The beach is not suitable for swimming there might be crocodiles. Town center is 2 km away. Website. Hotel Merlin had been the first address in town - but not the newest. Rooms overlooking the main road Ahmad Yani are loud. Some rooms need renovation. There are cars, motorcycles and guides for hire. Phone: 038761300. Hotel Tanto in Jalan Prof. Dr. Yohanes is very new, very expensive, has a lot of plastic stuff in the rooms and a sterile atmosphere. Phone: 038762500, 038761048 or 081283255500. Hotel Elvin has been renovated and extended again; it is very clean and well maintained. Rooms are large, those to the main road Ahmad Yani are loud, those to the curtilage quiet. The reception area is sedate but somewhat impersonal. Phone: 038761773 or 038761642. Sacca Residence & Resto has opened in February 2016. It is located in Jalan S. Parman 88, in the district Tandaroto on the road to Kambaniru and about 3 km from the center. It has small rooms with AC, bathroom and terrace. It is super clean, dignified atmosphere, perhaps a bit noisy through the restaurant. Phone: 038762877 and 085102707222, Email: saccacellular@gmail.com. Maramba Homestay + Cafe are located in Jalan Ikan Hiju 15, a quiet side street, next to the Western Bus Terminal. It has small rooms with AC, bathroom and a shaded terrace. The shop of the Chinese owner is directly opposite. Phone: 038761594 and 082147541354. Praikamarru Guest House - Prailiu offers 2 new traditional houses with bathroom and balcony. They are quietly situated, at the end of the traditional royal village. Tasty traditional food is served by the host family. In almost every Family of the village Women are weaving. Good starting point for an East Sumba trip and competent tour advice. You can be picked up at the airport. Booking via www.Airbnb.de number 5995083 or 081338093459. Hotel Sandalwood is just behind the Merlin. It is significantly cheaper; the atmosphere is pleasantly, personal and quiet. Rooms have different price ranges. Some rooms need to be renovated; sometimes there is a lack of cleanliness. Here you can also rent cars, motorcycles and guides. Ikat is offered. Phone: 038761887. Hotel Kaliuda is about 100 meters away from the Sandalwood and Merlin. It has very simple rooms, is also quiet. Construction works at the annex building are not yet completed. The site is closed at night. Phone: 038761264 or 038762806. Ama Tukang Ikat Shop + Homestay are about 1 km north of the road to the airport. You have to turn off at the Sekola Tinggi Ekonomi Kristen and keep left before the hill. It is completely new and has clean rooms with bath. Inexpensive, but without buying Ikat you will probably not leave. Phone: 085237474140. Wisma Cendana is located in Jalan Pulau Sabu, about 5 streets away from the hospital and 400 meters from the road towards Waikabubak. From the hill you have a wonderful view of the surroundings of the city. Nice atmosphere, friendly people but too far out without your own vehicle. Phone: 085239351351. Wisma Eldorado is located a bit outside the city, at km 5 Jalan Matawai Amahu (which is a bit loud) but on the way to the 2 new harbours and 1 km from the western bus terminal. It has 6 rooms with bath a terrace and is super clean. The Chinese owners are very friendly and keen to help. Motorbikes are for rent. Phone: 038761781 or 085238017879 and Website. Lima Saudara (5 brothers / sisters) is located in Jalan Wanggameti near the old port. It has simple rooms, personal atmosphere, and a lot of local guests. It is inexpensive and therefore usually full. A renovation is highly recommended. Phone: 038761083. Hotel Jemmy in Jalan Umbu Maria Hongu is simple, cheap and impersonal. Phone: 038762747. Wisma Melati in Jalan Marisi is simple and clean, but it has small rooms. It has a very dedicated owner family. Phone: 038762030. Maramba Beach + Resort are located about 10 km outside towards the north, behind the petrol station. I wouldn't name the rugged ocean front "beach". But there is a mini-pool. The buildings are built a bit too narrow to each other. Therefore it may be a bit noisy. It is equipped with plenty of Chinese kitsch. Phone: 081332222435 or 081234406126. Morinda Villa + Resto are 10 km outside or 1 km behind the Kambaniru Dam on a mountain top. The 5 luxury equipped traditional style villas have a great view. The place is something to hang out in an absolute calm atmosphere. The restaurant serves tasty local food. Without a vehicle it is difficult to get around. Phone: 081338893525 or 081339881244. Pantai Indah Li'ie is a beach area 15 km east of Waingapu, off the main road. For accommodation it offers camping facilities and an open sleeping floor. Phone: 081286384760 or 081337414228. Melolo - Losmen Hermino - The old losmen is renovated and reopened after a break of 10 years. It is close to the two telephone masts in the main street. The bus stops there. It has simple rooms, a bit small and unloving, some with AC. Melolo - Private Accommodation - At Sony Radjah's large family house you participate in the daily life in a small town. His house is opposite the Hermino behind the gallery of the weavers cooperative and provides more than just an accommodation. Sony himself works for the cooperative and is fluent in English. Book it well in advance. Phone: 085239238950 and Email: sabrina.gloria69@yahoo.com and www.facebook.com/sony.radjah. Nusa and Maukawini – In both villages you can stay at one of the fishermen’s houses. Accommodation is very basic! The food is great. Just ask. The area is good for swimming, snorkelling, hanging out and relaxing, but very dry. Kalala - Beach (Mr. David’s Surf Resort) is in the Baing region. It is Located at the west end of the reef. Due to the unstable wave it is only conditionally something for surfers. It is rather something for relaxing, fishing, horseback riding and exploring the countryside. Unfortunately nothing has been done to the buildings for years. After the death of the legendary Surfer Mr. David in 2012, his widow Ibu Jo(hanna) continues the resort. It is somehow archaic - a cult place with a kind of a ramshackle charm. I like it. Starting from Baing, you will get there, if you turn left at the school sign into new port road. At the school turn left again to the gravel road, then keep right and turn right onto a dirt road which is barely visible… Phone: 081353976282 and Website. Sumba Adventure Resort is located near the lighthouse of Kalala. That is not the most beautiful part of the Kalala beach. But the resort is beautiful shady. It is under construction. Different types of accommodation are planned. When you drive along the beach by quad bike, pay attention to the villagers and their work, don't destroy their seaweed cultures, and don't hurt children playing at the beach. Website. Kalala - villages at the beach. Between Mr. David’s and the lighthouse further east, there are several Savu villages. People are poor but nice. You can ask someone in the villages if you can stay there for a fee. Accommodation will be basic. The area is good for hanging out and relaxing, but also for fishing and exploring the countryside. Kananggar - ask at one of the little kiosk at the junction, they will have a place to stay. Manggudu was a surfing resort. In 2007 the resort was vacated by the Indonesian army because of contentions between Mr. David and the Indonesian administration. Katundu was the place, where boats sailed for Manggudu. Since the surfing resort does no longer exist, the homestay Katundu is also closed. Ask the Kepala Desa if you can stay at his place. Nice beach for hanging out. Tawui Agus Homestay is located on a little hill between the two bridges and next to a cemetery. You live in a traditional house. Everything is very simple but also very clean. His property overlooks the bay and a small path leads down to the beach. Agus speaks very good English. Unfortunately he will probably be back in Tawui not before 2019. Praingkareha at the waterfall Air Terjun Laputi also has no accommodation. You can stay in the house or in the village of the Kepala Desa. Tarimbang – private home … there are some people where you can stay privately. Just ask for Marco or Petrus in the village. Peter's Magic Paradise is definitely closed, the bank searches a buyer. It is situated 300 meter high between Tabundung junction and Tarimbang, with a view of the bay of Tarimbang - 5 km away from the beach. The surrounding offers absolutely nothing beside the view. Lewa - Mama Riwu, also called Mamas Homestay, usually hosts birdwatchers of the nearby national park. Her homestay is located at the western milestone 1 Lewa between the 2 telephone masts. She has 7 simple but sparklingly clean rooms with shared bathrooms. Unfortunately it is too expensive, but Mama Riwu conveys a cordial personal atmosphere. She makes delicious food. Phone: 085239910745 or email to Budiyanto Karwelo b_karwelo@yahoo.de. He speaks English and German and will pass your request on to her. Wisma Sola Pora - is the only hotel in this district. It is located in Jalan Kabunduk in Waibakul, near the old village of Kabunduk. It is a state-owned hotel with different quality equipped rooms. All rooms have bath and AC. However, the building is something monstrous, lacking in individuality, and needs some renovation. It has a very nice and helpful staff. You can rent cars and motorcycles. Phone: 081246650002 and Email: wismasolapora@yahoo.com. Mambang or Aili Homestay is located directly on Aili beach. The construction is almost finished. There are 6 rooms. More information is coming soon. Hotel Manandang is the first address in town. Rooms vary in standard and condition, some are run down. It has a small back garden with some high standard rooms around. Phone: 038721197. Monalisa Cottages has rooms with different standard, meanwhile a bit shabby and so a bit too expensive for what is offered. It is a 30 minutes' walk to town along the western main road. It seems that they are no longer interested in foreign guests. Phone: 038721364. Hotel Artha is tucked away in quiet Jalan Veteran. All rooms with private bath are arranged like a horseshoe around the well-kept garden. It is clean and the people are super friendly and advise you competently. A traditional village and the tourist office are nearby. Phone: 038721112 or 085253253980. Hotel Aloha is situated at the main junction opposite church, hospital and football stadium. Rooms open onto a patio and all are quiet and clean, they vary in standard. It lacks greenery. At the entrance of the hotel is a ticket office. Phone: 038721245. Hotel Ronita are at the main road to Waingapu. Both are relatively clean, a little noisy, but cheap. Hotel Pelita is at the corner of Jalan Ahmad Yani and the road to Waitabula. It is centrally and noisy, expensive and since many years still under construction. Phone: 038721104. Waikabubak - Private Accommodation - Yuli (Yuliana Leda Tara) speaks English and French. She lived with her family in the traditional Marapu village of Tarung. Unfortunately the village has been completely burnt down on 7 October 2017. For current information phone: 082236216297 and email: yuli.sumba@gmail.com. Waihura - Joni (Johnny) Homestay is situated at the final end of the road. He has opened in 2015. He started with one beach bungalow with 2 simple rooms, 2 other will follow. It is located in the fishing village, directly on the beach of Wanokaka. The terrace offers a great view of waves, the sea and the work of the fishermen. Everything is very simple with a common bathroom. Good food and the friendliness of the family fascinated me. Joni also arranges horses for beach excursions and boats with which you can be brought to otherwise inaccessible beaches. Phone: 082144278120. Rua - Ama Homestay has 5 simple rooms with common bathrooms. It is on the right side of the pier, a few meters away from the shore. The owner family is very friendly and they make great meals. Phone: 082237429826 or 081237750720 or amahomestay@yahoo.com.au. Next to this, a Hotel complex was built, which should be also operated by the Ama's. This project was financed from slush funds of the chief of the district government. After his temporary detention, the property was sold to private. Rua Resort or something like that will be the name of what Antonio wants to convert from the run-down water park into a hotel. It will be something between "nothing and Nihiwatu" in a few months. More information is coming soon. Nihiwatu has very nice staffs who tell a lot about the resort and their owners. Travellers who want to enter the resort overland are not welcome. It seems to be a reserve for another class of human being - an extraterritorial area - where Indonesian laws are not valid. It is strictly forbidden to feed guests of the resort with peanuts, when they are cavorting outside their territory. Booking is possible only via the website and before entering Sumba, Website. Marosi – Sumba Nautil is 1 km inland from Marosi beach in Lamboya. It is owned by Ali Derdouri, a Frenchman of Algerian origin. The well-maintained hotel area and bungalows have an international standard. The view from the pool to the west coast scenery is incomparably beautiful. It has an excellent French cuisine. Ali competently advises you about surfing, fishing, diving, and hiking. Naturally this has its price. But in Ali's chalet there are also 2 affordable rooms. Phone: 081337471670, 081339558652 or 038721806 and Website. Kerewe – Musa Homestay has opened in 2015. It is behind the fishermen building near the beach and has 3 extremely small rooms with shared bathrooms. Everything is very simple but clean. It is too expensive for that. Phone: 081353193033. Kerewe - Sumba-Surf is located opposite the Musa. Daniel makes a more friendly impression than the hosts of the other resorts. From the terrace you have a beautiful view of the sea. Everything is new and clean. However the rooms are almost as small as in Musa. Phone: 081246743172. Kerewe – Sumba Sunset Beach has also opened in 2015. It is about 70 meters above sea level and about 1 km from the beach with great views. The 3 traditional bungalows have private bathrooms. Phone: 085205917662 and Website. Watukaka Resort – opened in July 2016 small stylish individual extremely high-priced resort. Immersed in nature and totally isolated it provides great views of the nearby cliffs. The French owners have a demanding concept, something to hang out, nothing for active people... look yourself if it suits for you and your wallet: Website. Pero - Mercy (Merzy) Homestay. The owners of Stori Homestay have moved, now their place is called Mercy and is located on the beach road. Everything is new, very well maintained and clean. It is an oasis in the otherwise rather rugged village. There are several shared bathrooms, common areas, a prayer room, karaoke room, and a beautiful watered garden. It is run by a lovely and attentive Bugis family. They make a super tasty food! It is a place for surfers and a good starting point for visiting the villages along the coast. Phone: 081337557272 or 081337803613 and Email: mega_muslimah@yahoo.co.id. Wainyapu - here you will find a nice private accommodation in a traditional house of the extended family of Thomas. He can pick you up in Bondokodi. Phone: 081236122423. Newa Sumba Resort is located at the north coast near the airport Tambolaka, 4 km east of Waikelo. It was built very extravagantly. Sometimes it makes an empty impression. The surrounding is savannah. The beach is ok. Very high priced. Booking is possible only via the website, Website. Oro Beach Houses and Restaurant is located directly at a small beach. It is a small and individual resort to relax, bathe and snorkel. Food is very tasty. The German-Indonesian owner is very helpful. Good starting point for a West Sumba trip. They give a competent tour advice. It is located close to the airport. You can arrange to be picked up from the airport. From the Tambolaka Katewel road turn left at the sign Mako Brimob, then it is 5 km asphalt and dirt road - or take the asphalted road via Mananga Aba. You can hire motorbikes, mountain bikes, and snorkelling gear. Phone: 081339780610 and Website. Hotel Mario + Cafe are located at Mananga Aba beach. ... further description had to be deleted. Sumba Hospitality Foundation is a college of hotel management with attached small hotel business. You live in stylish round houses and can be pampered by the hotel school students. The Management helps planning your excursions. To the beach it is 3 km. Website. Hotel Sinar Tambolaka is in the Jalan Radamata opposite market, gas station, and Waikelo junction and is reached via a narrow driveway. It is the Airport hotel with appropriate ambience and prices. Rooms have different standards and are partially run down. The attached restaurant is good and reasonably priced - with a beautiful view of the countryside. Phone: 03872534088. Hotel Sumba Sejahtera is also located in Jalan Radamata, close to the Sinar Tambolaka. Standard and prices are similar. It has just opened and everything was super clean. Unfortunately, it is very sterile, dark, and impersonal. Phone: 03872524123 or 082218179999. Penginapan Melati is on main road between telephone mast and Kodi junction. A nice helpful family cares for you. From the value for money point of view it is the best in Sumba. Many volunteers from charities and the Catholic Church stay here. Therefore rooms should be booked in advance, phone 038724055 or 085239910795. Villa Redemptorist, a restaurant and convention center of the Redemptorist Congregation in Waikelo, there are accommodations. Phone: Father Robert 081339362164 or Father Matheus 081391423294, Email: sumbarumahbudaya@gmail.com. Mamboro Mananga Homestay - here you can live with a Muslim family. Separated from the main family home, there are 3 very simple rooms with a clean shared bathroom, right above the river with views of the harbour and beach. Ibu Amina makes great food with fresh fish. Bapak Musha has a boat with outboard motor and would like to drive you around with it. Phone: 082154443934. Only in the towns of Waingapu, Waikabubak, Waitabula, Melolo, and Lewa you will find restaurants. And it is becoming more and more, but they are mostly empty. A restaurant culture requires that you can pay. Locals cannot afford them and tourists come very seldom. Food always tastes great with a family and better than in any restaurant. So I have no culinary restaurant recommendations. Leslie Café & Laundry in Waingapu, Jl. Lalamentik, next to Kaliuda hotel. A very hard-working team makes you a super tasty food. D'Sumba Ate in Waikabubak, Jl Ahmad Yani 1, on the road to Wanokaka. It has neat atmosphere with super tasty food. Gula Garam in Tambolaka is at the road to the airport. It is the first restaurant with pizza oven in Sumba. As an "Orang Bule" you must go to these places, for starting your Sumba trip, and for exchanging information. Typical Indonesian Warungs and night markets are rare in Sumba and have a limited menu. But after sunset in Waingapu you will certainly find something tasty at fish stalls at the old harbour and in Jalan Ahmad Yani near Elvin hotel. In Waikabubak Warungs can also be found in Jalan Ahmad Yani, and some food stalls are in the market. In Waitabula you find Warungs along the main street. The day in towns in Sumba ends very early, latest when electric power goes off again. Therefore you should start right after sunset and take your flashlight. If you participate in traditional festivals, it is a must or courtesy to eat with the people. The food consists of rice and parts of sacrificed animals. You may have good luck or bad luck. As a special guest you sometimes get a piece of raw liver as a special honour. Rice is the main ingredient of each dish. In addition there is fish or meat from chicken, buffalo or beef; and especially for Christian’s dog or pig. Everything is prepared fresh, because refrigerators are rare - or as Dendeng, a smoked or dried and fermented meat from beef or buffalo. The local people eat only a few vegetables, mainly in the countryside. During dry season the supply of vegetables is also quite sparse. An alternative for eating in the dry season is Cassava (manioc) = Ubi Kayu, or a type you find in woods = Ubi Kayu Hutan. This is also offered with Gula Savu = Lontar palm syrup. Or seaweed that tastes like strong salted spinach. It tastes less severe, when it is mixed with grated coconut. As sweets specialties there is Mangulo: a paste of bananas and peanuts and Kaparak: a paste of maize and peanuts. In the streets of Sumba towns you feel like in a giant open-air construction market, combined with a stock of spare parts for motorcycles. There are only very few shops which attract tourists. In front of hotels and on the market you can buy Ikat or Tenunan (woven) cloth. Ikat and woven cloth you can get cheaper and especially more original directly in the villages. In the remote villages you need to ask, if you can buy such things. Guides have also recommendations - but usually get a substantial commission. In Waingapu you should definitely visit the factory of Ama Tukang. It is about 1 km north of the road to the airport. You have to turn off at the Sekola Tinggi Ekonomi Kristen and keep left before the hill. Ama has a huge collection of Ikat and he shows visitors the manufacturing process. More about Ikat is written in chapter history and culture. However his goods are not cheap, please make price comparisons. There are other shopping options in the city, for example in Prailiu. Phone: 085237474140. In Melolo the Galery Sumba Heritage, a weaving cooperative has just been opened. It is in the main street next to the telephone mast. Here are offered predominantly woven fabrics, manufactured by 240 women members from the Umalulu region and East Sumba. The cooperative buys woven fabrics at constant prices. This prevents that in times where much woven fabrics are offered the prices fall, like in dry season. This deactivates the Balinese intermediate trade. Other craft items from Sumba are woven boxes, containers, and baskets made of reed for Sirih Pinang. Although there is no gold extracted in Sumba, there is typical gold jewellery. Earrings and necklaces are given within the family over generations or end up as grave goods. For tourists you get replicas of gold or silver. (Gold)smiths are found in villages especially in East Sumba. It needs not be a heavy megalith as a souvenir for the front yard at home. At the Art Shop Hamid Algadi in Jalan Ahmad Yani in Waikabubak and in Pero smaller stones and wooden figures are available. As a visitor to a village you are usually a rarity. Villagers therefore expect behaviour from you similar to local visitors. This also means that you have to provide Sirih Pinang (betel) to your host. You get in any market - you should always have enough of it. As a substitute drug, you can use cigarettes or a 10000 rupees bill. A visit follows the following pattern: On the porch of the house they will first spread a mat (Tikar) on which you have to sit down. Your feet can dangle or you can sit cross-legged. You had better take off your shoes. Then you provide your host with Sirih Pinang which you brought with you. The host examines the gift very long and critically. Finally, he will give you a braided box or wooden box with Sirih Pinang. You take at least something from it, stick it in your mouth and say thank you for the kindness. You push the box back or to anybody in the round. Often also tea or coffee is offered. There will be many questions: What are you doing here, why do you visit us, how many children do you have, ... .
For a longer visit you will be offered food. For Sumbanese, it is important to provide you with fresh food to make you feel good. In any case, they don't allow you to leave, without heaving eaten. You must not refuse food. In more often visited villages they have a Buku Tamu (guestbook). There you write your name, address, ..., and finally put a bill into it. Usually there is a donation column in the Buku Tamu. From the previous entries, you can see what previous guests donated. If you want to stay in the village, you have to discuss this with the Kepala Desa (head of village) or Kepala Dusun (the head of the settlement). The donation should then be adequate. It is advisable to visit a Marapu village with a guide. You should not walk alone through a village, locals will always be happy to accompany you. You can easily get into a dangerous situation, without understanding what you did wrong. It is simpler in all villages that are closer to civilization; perhaps have a Christian faith, and where children or relatives already live in town. There rules are not as strict. That does not mean that there are no traditions. You cannot conclude from the external appearance, such as corrugated iron or a motorcycle, about tradition in the village. If you want to stay in a village or privately, actually you should have to register at the police. Most people in Sumba know how that works. You must stop at the local police station. Depending on the view of officials you have to sign in a book or just have a cup of tea. The lack of land for sale In Bali, and the price level are immense. Because of that and because of the proximity of Sumba to Bali swarms of investors look around for land in Sumba. They do this not only on foot, and with 4wd's, but also from the air with drones like vultures … and present their prey on the internet. Almost all beautiful beaches are already owned by Balinese or foreigners from China, Russia, France, … . Hotel factories as in Bali will not be built at once. For this the infrastructure is still too bad. But there is already a brisk trade. People buy and sell plots again, driving prices up. The proof of ownership is generally not verifiable. There is no land register, but only purchase and sales certificates as well as written statements that someone is owner. Before Indonesian courts you have absolutely no chance against a possible fraud. So it often happens that the same plot is sold several times. As a precaution some smart buyers purchase the same plot from several sellers. People, who have lived on a supposedly featureless area for decades, suddenly live on valuable terrain. They might possibly be expelled, or their villages get burned down on purpose (cf. history/social structures). If you look at recently built roads in Sumba, you will notice that new roads are built nearly only in areas where no one lives and no settlement projects are planned. Instead of building a road connection to a remote village, a road is built for example through the jungle to the waterfall Air Lai Popu. Or a new road leads to a mountain – only to provide a beautiful view for whomever. Or a road through an unpopulated dry savannah around the western tip of Sumba. Or … . In many villages I have heard about the idea of building a guesthouse for visitors from foreign countries. It would be great if such a facility opened a source of income for the village. With this necessary acquisitions could be made, medical care could improve, something for the future of children could be done, and people in the village would get a job. Such an idea will only work if the villagers want foreigners in their midst and are really willing to make the guest feel welcome. And the other way round, tourists want a situation where they are accepted in their very different lifestyle. Where they enjoy staying and can live out their South Sea dream, exoticism and adventure. To realize such a project, both sides have to set up a catalogue of what is wanted. During my travels I have often discussed this topic. The success of such a project is not whether the construction costs for a house in the village get paid back. Important are the consequences that arise from the encounter of different cultures. Another problem is the speed with which things change in Sumba. For example there are changes in the family structure. Someone moves away because he finds a job. Also social distress, illness or deaths are closer than with us. Also the environmental situation can change. Some years ago I described a beach is beautiful. There was clear water and you could snorkel and explore the underwater world. Today, seaweed is cultivated there and you have absolutely no possibility to go into the water at all. I will report on this idea further on, here.